Marie and Jerôme welcome you in their environmental friendly gîte. 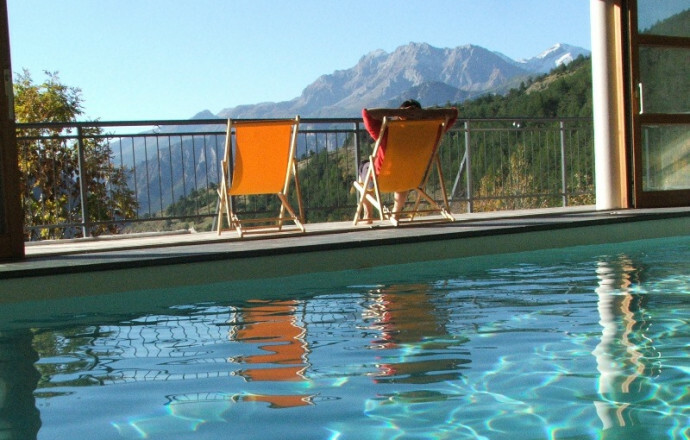 On a fantastic location overlooking the Durance valley, facing the surrounding massifs, the eco-gîte has all the elements you need for a unforgettable holiday: nice indoor swimming pool, spacious bedrooms with balcony and private bathroom, large sunny terraces. 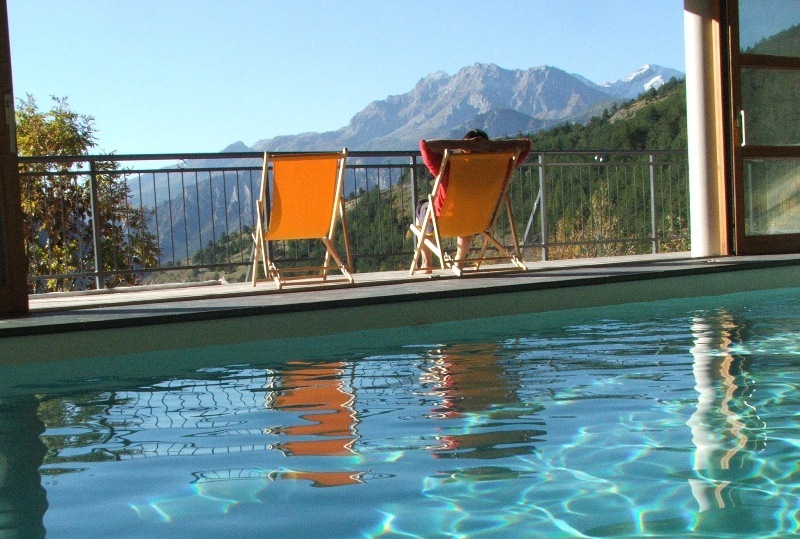 All this at the gateway to Les Ecrins National Park and near the large ski areas. 6 independent bedrooms, 3 of them with mezzanine (2 double beds -160 cm and 14 single beds. Wood boiler, house built with ecological materials. Available: large living room and sitting room. It is possible to enjoy your meals in your gîte. Storage room. Furnished outside area. Private parking place. Near Les Ecrins NP hiking trails, the ski slopes of Puy-St-Vincent and Serre-Chevalier resorts. Sheets and linen provided. Inside swimming pool in a separate building with terrace and solarium. Activity room with wooden floor, ideal for dance and yoga workshops, or meetings. Price of rent on request. These accommodations meet with very strict regulations concerning the environment, and are testify to the practice of responsible tourism. The 'Ecogîte' accommodations use renewable energy and are equipped with energy saving devices, they practise recycling and manage water resources. The buildings of this cottage were built through the use of healthy materials: brick monowall terracotta and concrete of hemp. Because natural fiber insulation is particularly powerful. The completed thermal solar installation of a boiler wood to produce all the heating and domestic hot water. The facilities of the cottage to manage energy, water and waste. room of 20 m² with terrace, bathroom suite toilet, 3 beds 1 place. room 13 m² with balcony, shower room and wc common to 2 rooms and relaxation area of 13 m², 1 bed 2 places and 1 bed 1 place. room of 15 m², private wc, 1 bed 1 bathroom, 2 beds 1 place on the mezzanine.